Disco Soup Oxford #3 was held in Bonn Square, in Oxford city centre– on Saturday 1st November 2014, 12noon – 5pm! WE FED 800 + PEOPLE FROM PRODUCE THAT WOULD HAVE OTHERWISE GONE TO WASTE! Here’s a vid featuring much footage from DS#3. Good Food Oxford & Hubbub supported the Disco Soup Oxford collective to put this on, and Green TV filmed us in action! Thanks so much for all of you who came down to peel, dance & feast to the live music, find out more about how much food gets wasted, what delicious soups you can make with leftover veg and all sorts of exciting other entertainment! Thanks very much to the Gleaning Network for helping us source lots of scrumptious squash that would otherwise have gone to waste! Want to get involved in future Disco Soups? 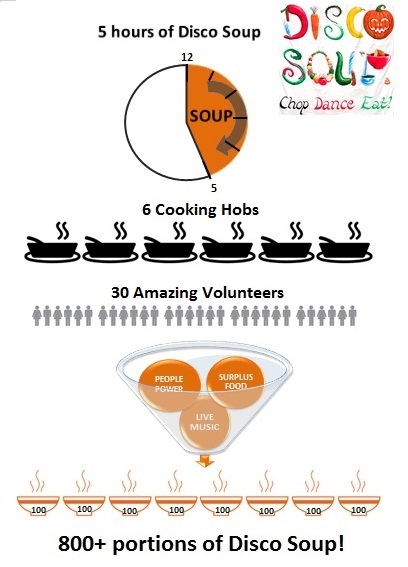 Disco Soup is looking for volunteers to help with the next event and with entertainment on the day! – in a band & want to play on the day? – in a theatrical collective & want to perform a food waste skit? – crafty and love making decorations? – want to help with publicity…? Get in touch: email DiscoSoupOxford@gmail.com ! To join in future Disco Soup event planning, please email DiscoSoupOxford@gmail.com!